Update: iMyFone Umate Pro Giveaway is now closed. The iMyFone marketing team will contact our winners. Our winners will also be asked if they want Mac or Windows version of the software. iMyFone Umate Pro is a software that allows you to delete any or all information that you choose from the iPhone, iPad or iPod. Rumor has it that this software is the safest iPhone data eraser on the market today. We will test the iMyFone Umate Pro and provide 10-lifetime licenses of this useful application for our readers. As always, to enter this giveaway all you have to do is like WinCert and iMyFone Facebook pages and leave your full name and e-mail in the comments below. Please have in mind that your e-mail address will remain hidden and will be available only to WinCert admin. Winners will be announced on November, 25th. With Giveaway promotion rules set we can now review iMyFone Umate Pro and see what this application is all about. After a straightforward installation, the consumer is presented with a simple to navigate the home screen and inform you to connect your Apple device. From the 1-Click Free Up Space, I ran the scan of my iPhone device that took less than a minute to complete. I was pleasantly surprised to see that I am able to free-up 13.29GB on my 32GB iPhone 7 device. When you click on the Clean button for any of the available categories that include Junk Files, Photos, Large files and Apps you will be able to select what to delete. If you select to clean the Temporary Files it will automatically start the deletion but this process will take some time to finish. In my case, this process lasted for about 15 minutes. If you choose Pictures to save space on your Apple device it will automatically offer you to do a backup and then will compress your images without losing quality. 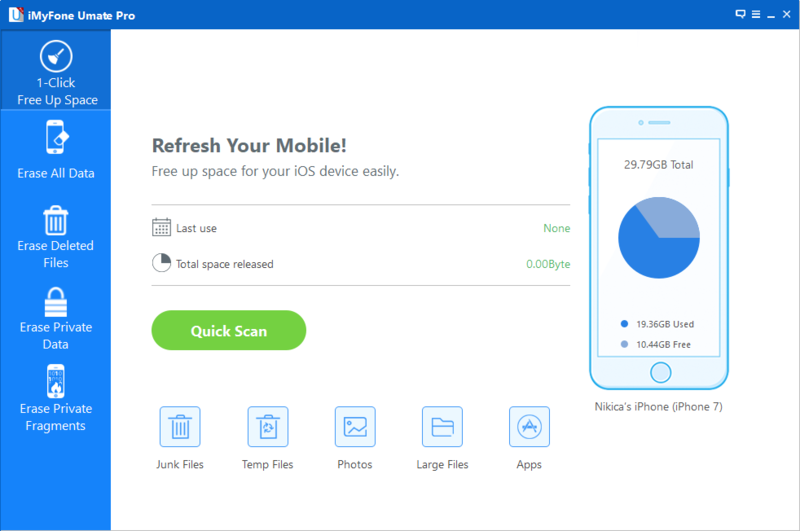 Large files will show the largest files that are stored on your device. With the thumbnail, file name, format, and size it is easy to select, backup and then delete those large files. Most savings come from Apps where I was able to save 10.10GB. You can check Apps that occupy most of the storage space and decide if you want to delete them or not. If you are concerned about your privacy you are able to permanently erase third-party application fragments, private data, deleted files or erase all of the device data. This is especially useful if you plan to sell your device and want to be sure that no one will be able to recover your sensitive data. Please note that in order to use this feature you will have to disable iPhone/iPad backup encryption as you can see in the picture below. To conclude, iMyFone Umate Pro allows you to preview and then select different kinds of iOS data for deletion, and there is no possible way to recover it. Your privacy is therefore secured. So far we haven’t had a chance to test the software that works like this and provide a high amount of independence and privacy. Furthermore, it has 5 erasing options and you can permanently erase already deleted files. With the option to delete all data, without exception, you can literally say goodbye to “not enough space” notification that can be rather annoying. Lastly, it is so cool that this software actually delivers everything that was promised and consumers can completely adjust the deletion process to their specific needs. It has five wipe modes that can be used to wipe away personal data. Easy to use, no fear of deleting the wrong thing, reliable and very accessible when it comes to its price, this software really won us over. Thank you for the opportunity to participate in the wonderful giveaway. 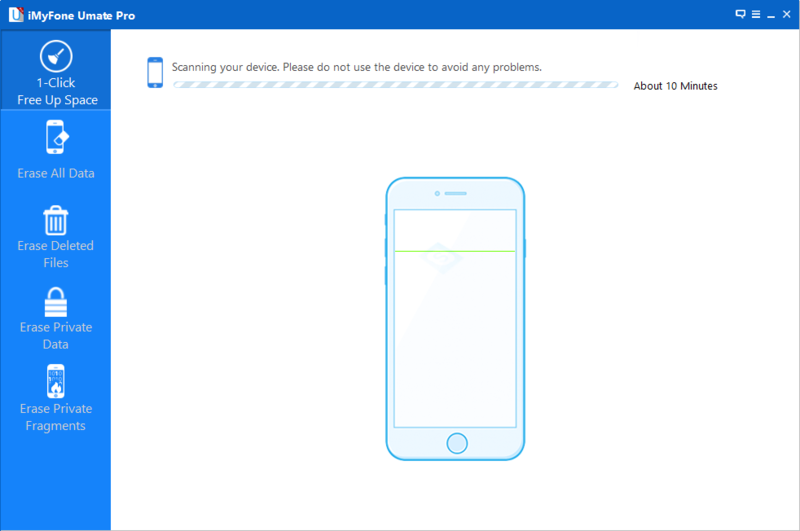 With any luck, I’ll have a reliable device iMyFone Umate Pro to remove personal information to sell or return to repair their devices. Thank You for this review and chance to win a license for this tool. It is a great space saver for my iPhone and Mac. That’s very kind of you to offer this app. I have not used it before. Thanks for this giveaway! iMyfone is the safest data eraser so looking to test it. Top review posted above & cheers for the chance to win. Consider me as contestant. Following Wincert on FB now. Great thanks for hosting iphone app giveway!. thank you wincert for hosting new contests. Please count me in. Hello its a good hosted review & giveaway on thanksgiving weekend. Thanks for the opportunity.